Map of the United States of America / Gridley, sc. 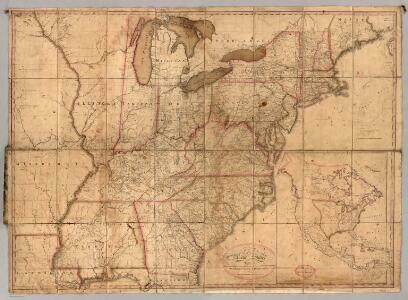 Map of the United States of America / J. Melish, del. ; H.S. Tanner, sc. United States of Nth. America = Carte des Etats-Unis de l'Amérique Septentrionale / copiée et gravée sur celle d'Arrowsmith; corrigée et considérablement augmentée d'après les renseignemens les plus authentiques par P.F. Tardieu, graveur, editeur-propriétaire, Place de l'Estrapade No. 1; ecrit par J.J. Pachoux; Chles. Picquet, géographe-graveur, Quai de la Monnaie No. 17. Reference & Distance Map Of The United States. 1 : 1584000 Young, James H.
Mitchell's Travellers Guide Through The United States. 1 : 14878700 Young, James H.
1 : 8000000 Seaman, James V.
Chapin's Ornamental Map Of The United States. Mitchell's Reference & Distance Map Of The United States. Map of the roads, canals and steam boat routes of the United States: with the distances from place to place carefully noticed ... / designed for the use of travellers by H.S. Tanner. 1 : 1964160 Woodbridge, J.L. Mitchell's National Map of the United States. Map of the United States of America. ; Carey's general atlas, improved and enlarged: being a collection of maps of the world and quarters, their principal empires, kingdoms, &c.
United States Of North America. 1 : 6500000 Winterbotham, W.